At Continental, the first day of spring is marked by a yellow rose, a tradition started by Rich Bell, one of Continental's co-founders. Each year, Rich would deliver a long-stemmed yellow rose to the many ladies in the community who helped his business life go smoothly. Roses were given to all the ladies in Continental's office, the county courthouse, city hall, title companies, realtors, and on occasion, competing businesses. The list grew each year, brightening each person's day. This act of kindness and caring showed not only the sincerity and thoughtfulness of Rich as a person, but is an example of the qualities that were the groundwork upon which Continental was built. 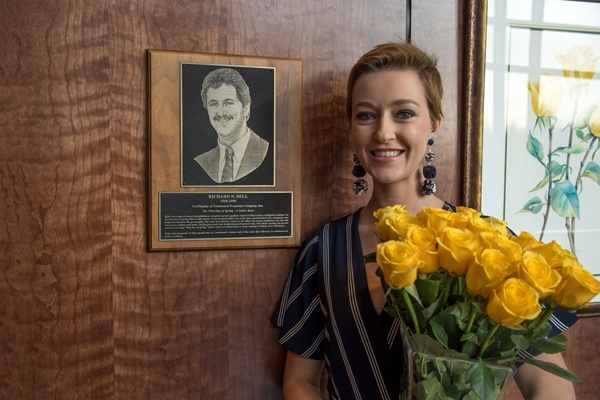 Pictured above, Tess, Development Coordinator at Continental and daughter of another co-founder, Jim Schloemer, is brightening Continental's office with yellow roses on the first day of spring nearly forty years after Rich began this tradition.